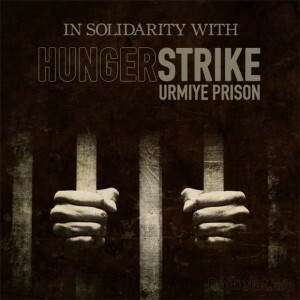 The resistance of political prisoners in Urmiye’s central prison attracted attention of regional and global media outlet’s attention to the subject. On 24th day of resistance the inmates persist on continuing their hunger strike with great determination even though their health condition has aggravated. The hunger strike of political prisoners which started 24 days ago continues despite pressure and jeopardize from regime authorities and intelligence agents. According to Newroz TV during the past 24 days, an agent from ministry of intelligence named Alireza Tabesh summoned the political prisoners multiple times and threatened them to end their hunger strike or they will face severe consequences. Last week Urmiye’s Ministry of Inteigence held a meeting and invited Urmiye’s religious Imam where he stated: “Do not pay attention to their hunger strike and ignore their demands”. On the other hand, number of political prisoners who are joining the hunger strike movement is on the rise and subsequently the number of attacks on political prisoners by prison officials has also increased. 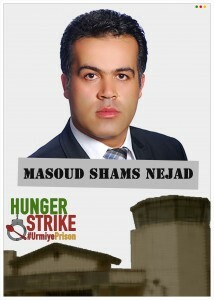 In the 20th day of hunger strike, the Kurdish lawyer Masoud Shams Nejad joined the strike, however after two days he was attacked and harassed by prison guards. It’s worth mentioning that four months ago, Masoud Shams Nejad lost his license and was jailed for four months on charges of contacting Kurdish media outlets. Masoud Shams Nejad previously defended Hossein Khezri and Habibollah Golparipour as a lawyer. According to latest reports, prisoners who their health condition has been getting worse are Sirwan Najawi, Abdullah Temoue, Sherko Hassanpour and Ali Afshari. It’s worth mentioning that Alireza Rasouli was first hunger striker who started strike 35 days ago, human rights activists fear his life in immediate danger. According to newly released reports, political prisoners in prisons of Sine, Rajae-Shahr, Minab, Zahedan and Bandar-e Lengeh declared their support to political prisoners of Urmiye’s central prison.